If you’re looking to achieve exceptional coral growing conditions, Alkalinity testing is a must! Keep it steady with the new GHL KH Director®. Get a first-hand look at the KH Director®, shown first at MACNA New Orleans! Fully control and automate Alkalinity supplementation like a PRO! Lab grade quality and precision, only the best for your reef. 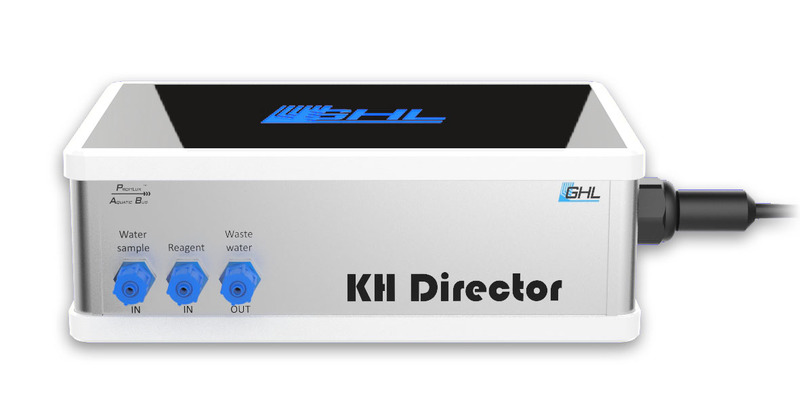 The KH Director® is designed to work in conjunction with a GHL Doser 2 Standalone or a ProfiLux Aquarium Controller 3 or 4 with a Doser 2 Slave for operation. The 2 inlets and 1 outlet of the KHD connect to 3 dosing pumps on the Doser 2 (2.1). These 3 pumps are then responsible for accurately transferring fluid to and from the KHD. Read all details about the new KH Director® here. Shipments are started from 12/11/2017, orders will be shipped in the order they are received. Due to the very high demand we expect that it takes several weeks until all pre-orders can be processed. You will not find the new products in the GHL webshop yet, if you want to order the KHD directly from GHL the contact us via email.